Inscribed below the image borderline at left: "Lanfranc a naple aux St. Apotre," and at lower right, just inside the borderline, the minimal trace of a burnished out signature, "frago." (http://www.metmuseum.org/collection/the-collection-online/search/369291?rpp=30&pg=1&ft=fragonard+saint+luke&pos=1) and at Cleveland Museum (http://www.clevelandart.org/art/1926.282?collection_search_query=fragonard&op=search&form_build_id=form-2k5EWZaxN5j2uC0wbjsj_0eShn0Umot5jzkInFdsG1A&form_id=clevelandart_collection_search_form). Condition: richly-inked and well-printed lifetime impression with margins around the borderline (i.e. 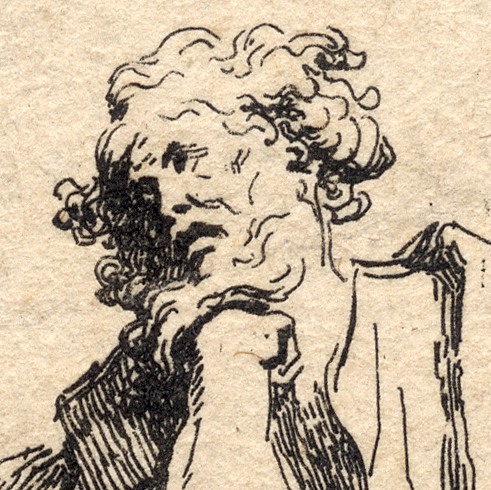 the sheet is trimmed within or on the platemark). The sheet is slightly age-toned (i.e. 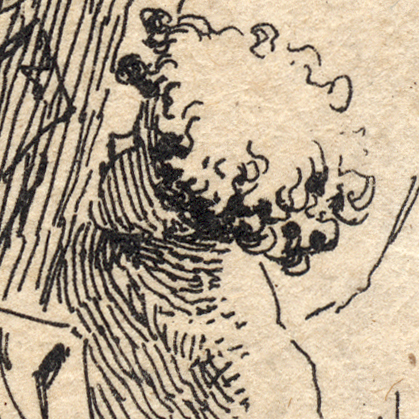 it has mellowed to a light brown) and there is a flattened a diagonal crease. There is also a pinhole in the upper-centre edge and there are traces of mounting with collector’s pencil notations (verso). I am selling this of lifetime/first state impression of magnificent quality for the total cost of AU$258 (currently US$204.96/EUR171.80/GBP159.05 at the time of this listing) including postage and handling to anywhere in the world. If you are interested in purchasing this original Fragonard—mindful that prints of this rarity and quality are seldom seen on the market place—please contact me (oz_jim@printsandprinciples.com) and I will send you a PayPal invoice to make the payment easy. What makes Fragonard’s seemingly simple and very small print interesting for me is that the original design was by Giovanni Lanfranco (1582–1647) whose stylistic leanings arguably lie between late Italian Mannerism and early Baroque. 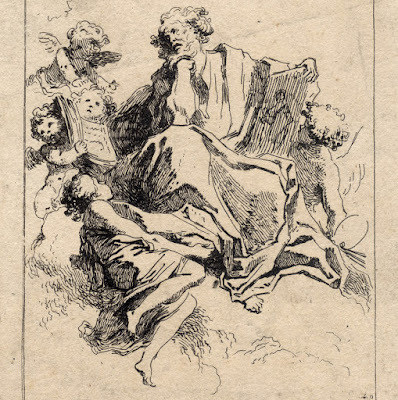 Mindful that Fragonard’s print is Rocco in style and is based on Lanfranco’s painted pendentive in the Cathedral of Napes/Church of the Holy Apostles that is Baroque in style raises the question: what special artistic ingredient came into play in Fragonard’s etching that shifted the same image from the Baroque period style to what could be described as the Baroque style on steroids typifying the Rococo period? 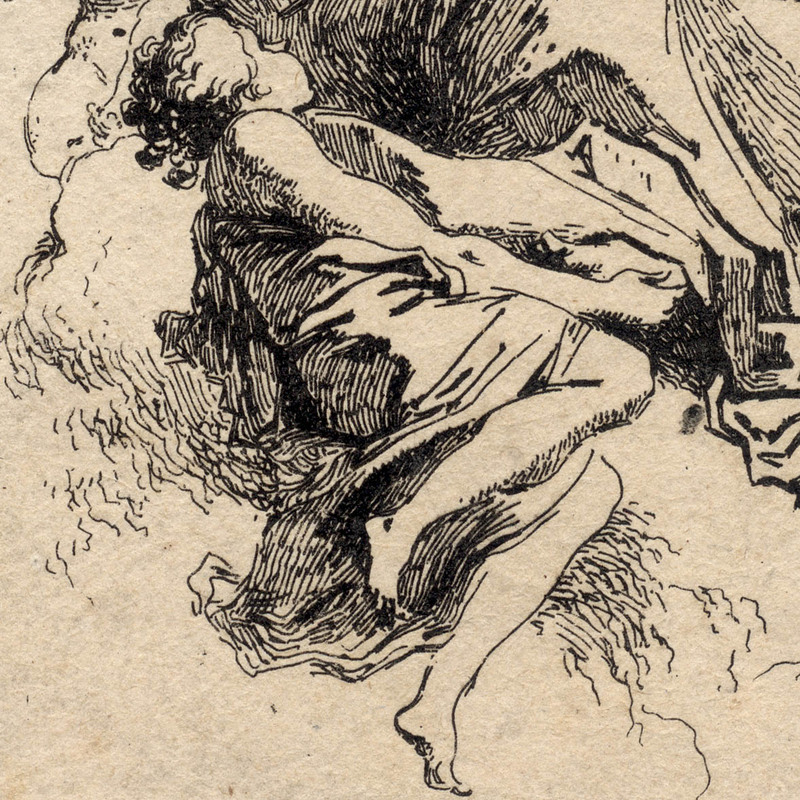 The short answer is all about how Lanfranco’s painting was interpreted and translated by Fragonard into line. 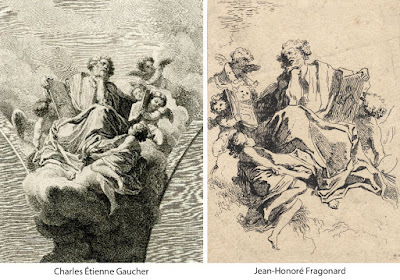 To illustrate the stylistic leap from Baroque to Rococo that Fragonard has achieved in his interpretative etching, I wish to draw a comparison between Fragonard’s print with another reproductive print of Lanfranco’s pendentive design by one of Fragonard’s contemporaries, Charles Étienne Gaucher (1741– 1804) (see: http://www.britishmuseum.org/research/collection_online/collection_object_details.aspx?objectId=1521096&partId=1&searchText=Fragonard+Luke&page=1). 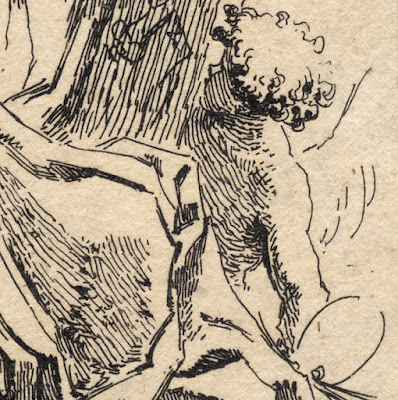 In Gaucher’s translation of the painting into a line etching (with engraving), the portrayed subject is presented as objective reality (i.e. the figures and clouds featured in Lanfranco’s painting are rendered with such gentle transitions of light and shade that the forms are almost tangible—3D solids). By contrast, Fragonard uses line sparingly and simplifies the tones of Lanfranco’s painting into a pattern of shapes. 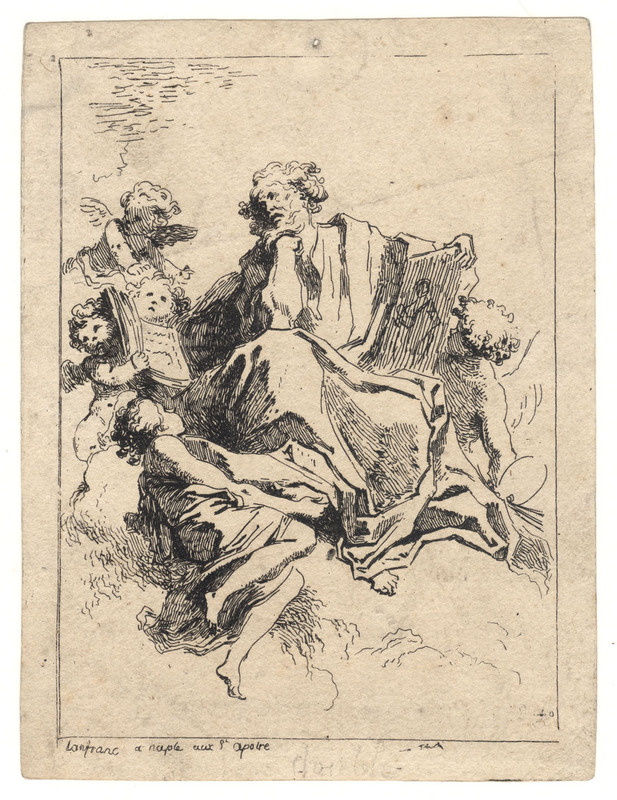 The critical “artistic ingredient”, however, that Fragonard introduces to his interpretative print is the complicated intricacy of these tonal patterns which seem even more intricate than they really are because of the large expanses of untouched paper framing them. For me, this “framing of complicated intricacy” lies at the heart of the Rococo period style. 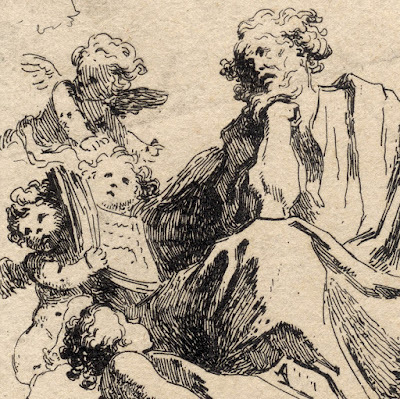 After all, even the word “Rococo” is derived from the French word, “rocaille”, which means “rock and shell garden ornamentation” (see: http://all-that-is-interesting.com/seventeenth-eighteenth-century-art-the-rococo-movement).